I took this photo to show everyone the size of the Butter Nativity next to a real person. Why is there a Butter Nativity? Good question. Glad you asked. At the Iowa State Fair, a butter cow is made and displayed. every. year. 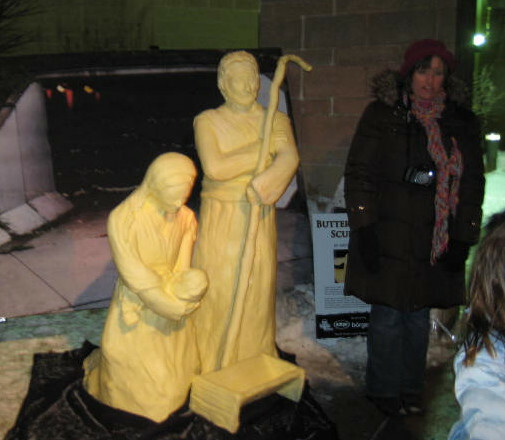 The artist was asked to create the Butter Nativity for a downtown event last weekend. 400 pounds of butter. It was not meant to be moved, but it ended up at our church this evening. We even had visitors from outside our congregation viewing it. The kids and I were dissing the butter all week, but once you see it, it really is cool. And on my way out, I heard a LOT of kids excitedly talking about the Butter Nativity to their parents. So the moral is: make life interesting for people and they will become enthusiastic. We also had a live nativity with adorable miniature animals and kings displaying their gifts just down the sidewalk, and caroling inside the hall, but those are not interesting; they are normal, expected Christmas happenings. The kids were not talking about them. They were all about the butter. If you didn’t investigate that link above, the Butter Nativity was created for an event that raises awareness for the homeless. Mary and Joseph had to flee to Egypt when Jesus was born and were homeless. St. Joseph’s Emergency Shelter is the only mid-Iowa homeless shelter where entire families can stay together. Homeless shelters typically segregate by gender, which breaks up families. This entry was posted in religion stuff and tagged butter nativity, homeless. Bookmark the permalink.